Escape Waikiki as we take you to the North Shore of Oahu. 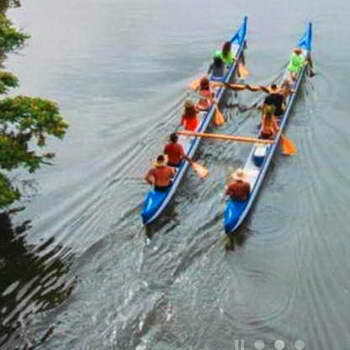 Join along as we help you to explore the Anahulu River on a traditional Hawaiian outrigger canoe. Riders will then hop into the canoe and learn for themselves the ancient art of canoe travel, giving the feeling of traveling back in time. Enjoy some beach time or soak in the sun while playing near Green Sea Turtles. 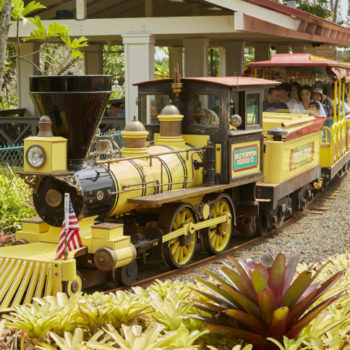 After an amazing lunch, all aboard a Historical Plantation Train Ride at the Dole Pineapple Plantation. Our local tour guides will ensure you return home with a part of Hale’iwa in your heart, as we introduce you to Uila ke’oke’o (White Lightning) and Ho’olako (named after the Year of the Hawaiian) our traditional “Wa’a Kaulua” (double-hull outrigger canoe). You’ll learn its many uses in Polynesian travel and culture. 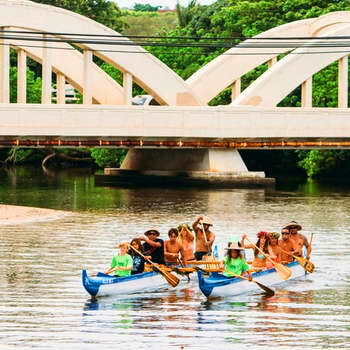 Your guide will teach you the basics of “Hoe Wa’a (canoe paddling) we’ll then depart on our journey up Oahu’s longest river “Anahulu stream”. Viewing an abundant shore of Hawaiian fruit and plants, we may enjoy a brief visit from a breathing Honu (sea turtle), a soaring “IWA” bird above, or a gentle breeze of Kamakani (wind). 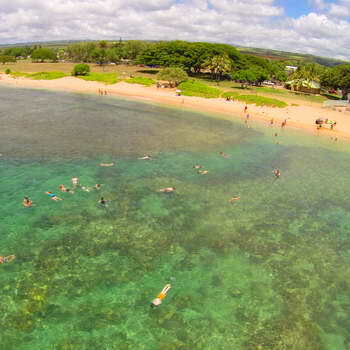 Making our way down river we’ll glide under the Rainbow Bridge as she reveals the ocean, historic landmarks, and shores of Kawailoa in Waialua Bay.